Dude ranches. Golf courses. Spa culture. Wildlife. Shopping, shopping, shopping. Though Tucson, Arizona might be known for all of these things -- and more -- none of them is what Aaron Mi chael Morales’ powerful debut novel is about. Not even remotely. 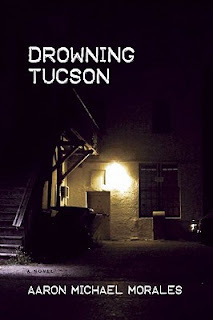 The carefully connected stories we find in Drowning Tucson (Coffee House Press) explore Tucson’s seldom seen tough streets, focusing on the disintegration and desolation of the doomed Nuñez family. This is Tucson as most of us could not begin to think it: the painted desert like distant and beautiful imagination and with a heart of violence pounding at its core. Certainly violence plays an important role in my writing, but it’s not violence for the sake of violence, or the ever-dreaded “glorification of violence” that gives violent art such a stigma in the eyes of people who don’t dig deeper than their visceral reaction to people hurting one another. Instead, what I seek to address are cycles of violence, as well as what is at the root of violence and humanity’s disturbing violent tendencies. Morales’ vision is disturbing, haunting though sometimes even strangely hopeful. If there also occasionally appears to be an unevenness in the telling, I’m not convinced this is not part of Morales’ art which, like his talent, is considerable. Two things seem certain: you won’t ever look at Tucson in quite the same way again. And you won’t rest easily until the last page is turned. I thought his work was fairly melodramatic...am I the only one? It read like a teen drama with a little extra murder and violence. Every character and story had to have some over-the-top climax. I'm just glad I got the book for free from a friend who received it for free himself. I agree, KG. I thought it was melodramatic . Seems like more and more writers now adays are catering to that overdramatic teen demographic.